Anyone who has worked in an office can attest that in the summer months, the air conditioning turns your workspace into an ice-cubicle. Sure, it feels amazing after a sweat-inducing commute, but once the goosebumps set in, you find that you’re in need of an extra layer to wear atop your summer workwear wardrobe. And that’s where the summer jacket comes into play. Having a few toppers on standby at your desk might seem counterintuitive when it’s 90+ degrees outside, but it’s a savvy way to maintain a polished look when you’re trying to keep frostbite at bay—okay that’s dramatic, but you catch our drift. The key is knowing how to mix in lightweight layers with the warm-weather office staples you wear regularly like dresses, skirts, tops. This will help you avoid a situation where you have to cocoon yourself in a random blanket that’s been floating around since the holiday gift exchange. To get ahead of the overactive office A/C, we’re spotlighting four versatile jackets to ward off the chill. Plus, we’ve assembled fool-proof outfit combinations that you can repeatedly rely on whether you’re dressing up for a major meeting or down for a summer Friday. A pinstripe blazer is super polished and a perfect layer over tailored separates when you have an important presentation or new business meeting on the calendar. For modern effect, aim for a double-breasted style in a soft pastel or neutral shade and team it with a midi skirt, waist-cinching blouse, lace-up sandals and resin earrings. 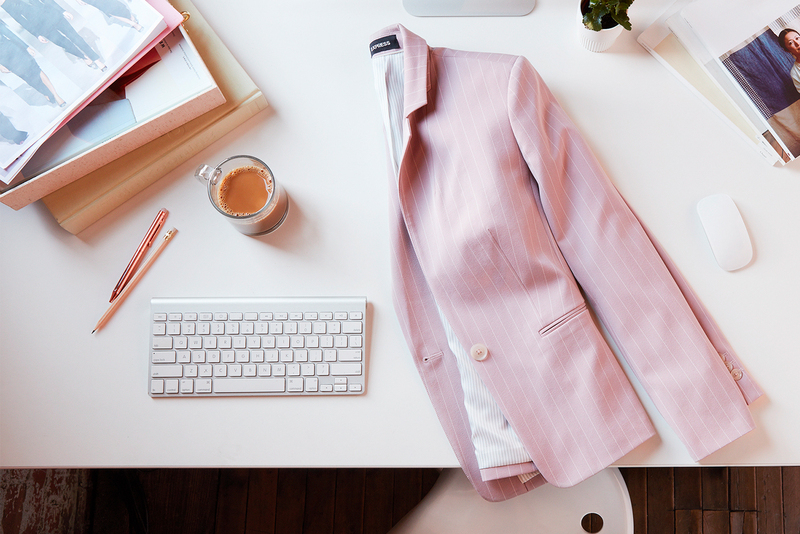 The feminine pieces keep the blazer from feeling too stuffy while a tonal palette ensures your look is cohesive. If you’re more of a pants person, simply swap for a wide-leg trouser—a hero silhouette this season. A long-line trench flows nicely over fluid dresses. Look for a style that hits at the knee to balance out shorter hemlines or to hit just above a midi length. Scrunch up the sleeves so the jacket looks more like a cardigan and cinch the belt in the back for a waist-enhancing effect. If you work in an environment where jeans are commonplace, a white quilted moto jacket is a cool layer that transitions perfectly to drinks after hours. Optic white pops against a variety of washes, too. For a sophisticated Summer Friday look, go for a tailored high-rise pair with a striped tee tucked in. 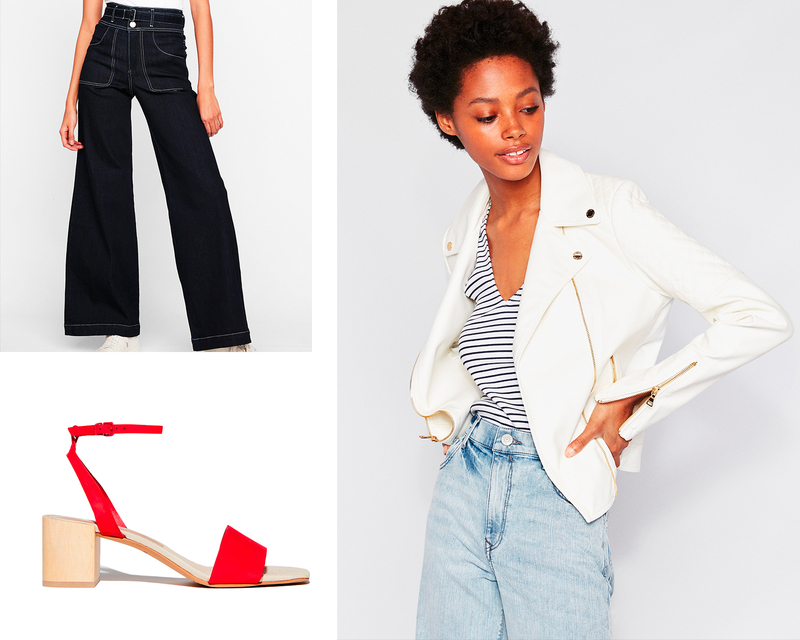 The contrast topstitching on the jeans ties the moto and tee together seamlessly while red block heels and gold drop earrings offer a cheerful finish. 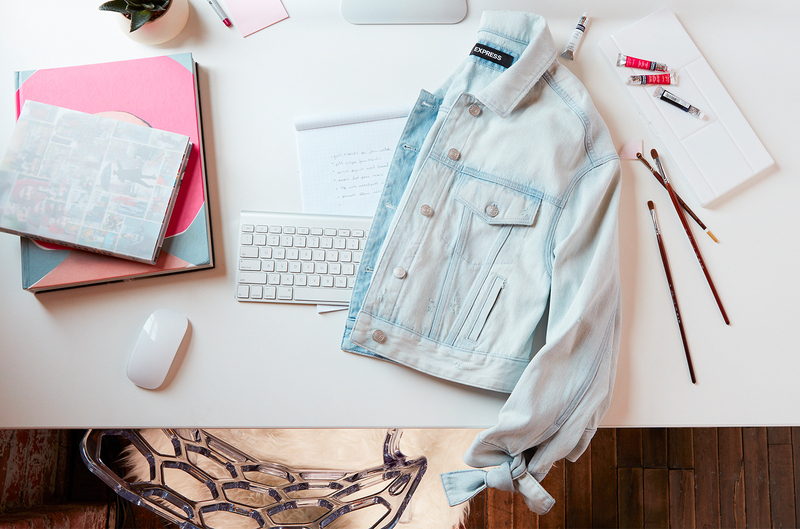 Denim jackets are inherently casual but one with special details like bow-tie sleeves can work at the office. Incredibly versatile, they’re easy over sleeveless tops and dresses—the sturdiness of denim is a nice counterbalance to swishy fabrics like silk when you don’t want to look overly formal. Simple sandals and gold jewelry will give your look a smarter edge.